When Apple made the decision this year to switch from the 30 pin connector that they introduced in 2001 to the new lightning connector on their devices today, the world went into a panicked frenzy. Now, households were going to have a mix of 30 pin devices and lightning devices, until eventually every Apple device they owned had a lightning connector. The lightning connector is slimmer, can go in on either side and is considerably faster at both data transfer and charging. Because the connector is smaller it’s less likely to cause the cord to break if it gets tangled. The lightning connector also does away with the locking clip which makes it easier to pull the cord away from the device. Although Apple’s loyal customers with older generation iPods, iPads and iPhones mixed into their iLifestyle, are undoubtedly upset, it’s Apple’s accessory partners that have to be feeling the biggest pinch. Companies that were known for their data accessories like Griffin, Belkin and even Verbatim, were able to revive themselves by making accessories for Apple’s consumer electronics. Fret not, all of the accessory companies will eventually get around to making accessories with the lightning connector. Belkin is actually the first one out of the gate. The popular accessory company has produced a car charger and a home dock which both have lightning connectors. While many of the case manufacturers have already had an iPhone 5, iPad Mini or the new, the new iPad case ready to go, accessories for power and audio are the ones most affected. Larry Fishback, an Apple customer we met at the Lenox Square Apple store this weekend told us “I’ve got a home audio dock on my desk at home and another at work, as well as an in dash system that all use the old connector.” Fishback is a loyal Apple user and was purchasing an iPad Mini this weekend. For now he says he’s going to use the 3.5mm cord adapters for his docks. He plans on upgrading his iPhone 4s to an iPhone 5 when more lightning accessories are available. Corrine Watson, also from Atlanta, is hoping that the new lightning connector devices will be able to control the music function on her iPhone 5. “Once I plug my iPod into my car stereo I can control it with the car stereo controls, I hope we can still do that with the itty bitty connector”. BGR reports that Apple is holding a workshop for it’s accessory partners on the lightning connector. There are also Asian knock offs already on the market. 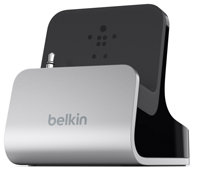 Both Belkin accessories retail for the normal $29.99 Apple accessory price.